Doctor in "Liv" d Catherine Eaton @LIVthemovie This movie has been renamed "The Sounding" and currently has a kickstarter kickstarter for "The Sounding"
Shared a personal story at the Elissa Dauria show, Theater under St. Marks"
Paul Michael's The Network Andy Roth: "Voice Over"
IIPS: World IP Day -- "Movies: a Global Passion;"
IIPS: "Ethics Considerations in Patent and Trademark Practice;"
New York Intellectual Property Law Association (NYIPLA) "Recent Supreme Court Cases;"
completed a course called "Creativity: Music to my Ears" from Stanford, online, taught by Tina Seelig. participated in the Good to be Bad contest sponsored by Jaguar photos of villain me with a jaguar and wrote a Villain Song, which still needs to be arranged. I have several e-mail accounts that forward to my Yahoo! account. I've never had a problem with this before. Then there was a lot more stuff after that with daemon messages. I've deleted my e-mail account name from the above picture. Other e-mails forward to my Yahoo! account from my microsoft online account are working fine. 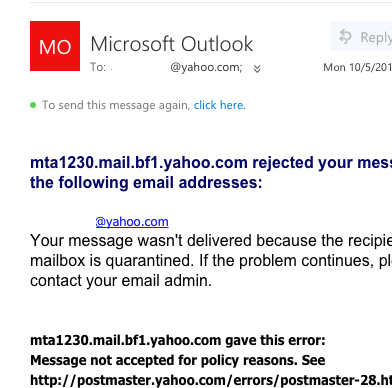 Curiously, Microsoft Online is also not accepting e-mails from this one user. This user is also a Yahoo! user. Then I decided to go to online help for e-mail. I posted my question. I called that number. The person there said my account had been hacked by someone in Phoenix and that I would have to pay money to get that fixed. I became suspicious, because I have no other indication that my account has been hacked. No suspicious e-mails have gone out. I asked how I knew he was really from Yahoo! Then he said it was up to me and hung up on me. Then I went back to online help and both of the messages purporting to offer me Yahoo! support phone numbers to call to get my problem fixed had vanished.